Why should you use Paintshield? 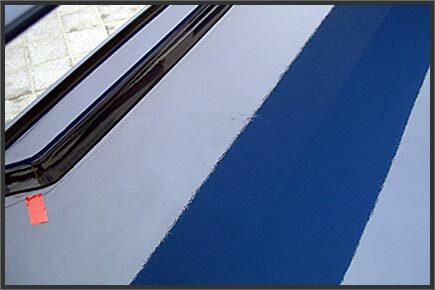 So why do customers worldwide choose Paintshield Paint Protection Products? 1. 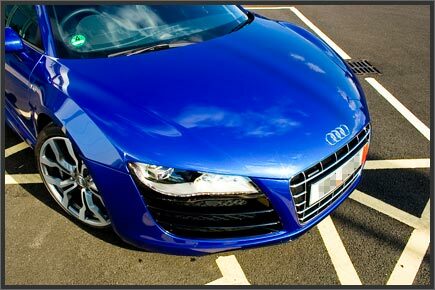 The most extensive Paint protection film warranties in Europe. Our warranties cover you for not only what the manufacturer should give you (yellowing and cracking) but have additional clauses guaranteeing the efficacy of the product, no other organisation to our knowledge outside of the Paintshield ™ family has the confidence to put money behind the product on car. Our warranty covers yellowing, cracking, peeling, lifting, shrinkage, discolouration, loss of gloss, harm to manufacturers paint, differential fading of the paint and (to our knowledge still unique to us in the UK). If it fails on regular road use we replace the film for free. 2. Shapes that are proven to fit again and again. Every kit is proven to fit by being installed fully on a car following design. This is why our designers take a full day on the car when designing. 3. We can sell you any film for your car, we currently have our preferences with regard to the Protection Films we apply and are confident that the ones we carry will meet our stringent warranty requirements, However if you have a preferred film we will be happy to fit that if you ask however we reserve the right to withhold warranty elements on non Paintshield ™ “approved” films. 4. NO ONE will absolutely and positively EVER take a knife to your paintwork. Our patterns really do fit so there is no need. We are aware of one client in Europe who for example had a competitor of one of our overseas operations take a knife to a Maserati MC12 (hope they are insured). Can you always be confident this will not happen to your car? "YOU CAN WITH PAINTSHIELD ™"
In six years and in thousands of cars installed (literally) we have not ONCE used a knife on paintwork to install film on a car, we would not allow it to be done to our cars so we see no reason you should expect it to be done to yours. 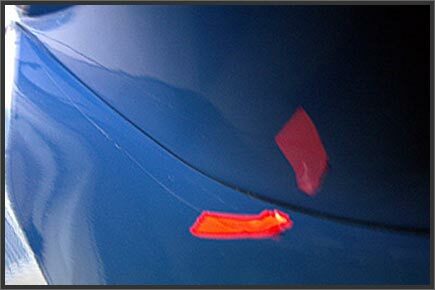 These are a couple of photographs showing the damage that cut and wrap dealers or inferior patterns can do to your paintwork. That line is not film and is an actual cut in the paint. With a quality supplier you need never fear this kind of damage. If this car had come to us then the customer would be a lot happier now and driving his car rather than shipping it back to Italy for a re-spray. This is truly heartbreaking. I am sure you agree, the orange markers indicate cuts in the paint. 5. We understand the paint that is on your car and understand fully how to deal with re-sprays and will advise you what needs to be done (if anything) prior to having your car fitted. We can only do this because we have spent years testing differing body shop repairs in combination with our film fitting and design. Are you confident that others are so fastidious? 6. We do not disassemble your vehicle, whilst we will wrap kit edges on request (any car) we wrap available edges without having to take the car apart thus protecting the car manufacturers warranty. 7. We research our vehicles, for example in Europe, film should not be fitted to the headlights of a 997 according to the manufacturers handbook (page 6 or 7 if memory serves) did your film supplier tell you this? Don't you think they should have? 8. We are backed and carry full liability insurance and motor trade policies to ensure if anything (which it won't) should go awry, YOU are fully protected ask to see competitors documents, you can be sure that the exotic car owners insist on this protection aren't YOU entitled to it, WE THINK SO. 9. 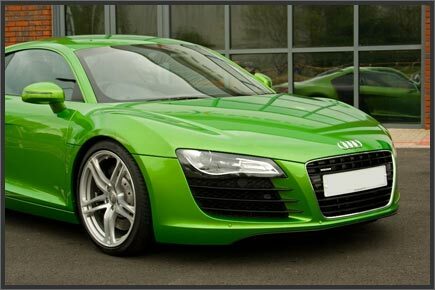 We are specialists in this business, this is all we do nothing but Paint Protection and Painted films. We live or die by our customers opinions on what we do. 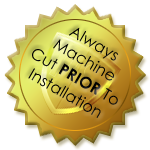 Customers come to us when quality matters, after all, you will be living with our work for many years to come so it pays for it to be right from the outset I am sure you will agree. When Image is important, where peace of mind matters and when quality really counts those in the know choose Paintshield ™. Shouldn't you? Call now on (+86) 010-6473-8267 and speak to one of our specialists today. NB. The above information was compiled and collated by Paintshield Ltd and does not necessarily reflect the view of any third party.